Philips B12 LED light bulbs with Warm Glow Effect provide 500 lumens of soft white light, equivalent to 60-Watt incandescents with 80% less energy use. These bulbs fit small candelabra (E12) fixtures with the look and feel of a classic bulb. Warm Glow dimming offers flicker-free, silent dimming that works with more dimmer switches than any other LED on the market. The more you dim, the warmer the light--from 2700- to 2200-kelvin just like traditional incandescent light bulbs. These best-in-class, Energy Star Certified Philips LEDs provide steady, natural lighting at 1/4 of the energy of incandescents, 1/2 the energy of halogens and with 10X and 4X the lifespan respectively. Philips LEDs are mercury-free so they don't contribute to harmful hazardous waste. Made to be seen, these decorative candle light bulbs are ideal use in candelabras and other open fixtures. Philips LED bulbs last 10X longer than incandescents and 4X longer than halogens making them a great choice for multi-socket candelabra lighting fixtures. Not for use with Philips Hue products. This 4-pack of B12 LEDs is expected to deliver a lifetime of up to 25,000 hours and over 20 years based on standard usage of three hours per day, saving you the cost and hassle of frequent bulb replacement. 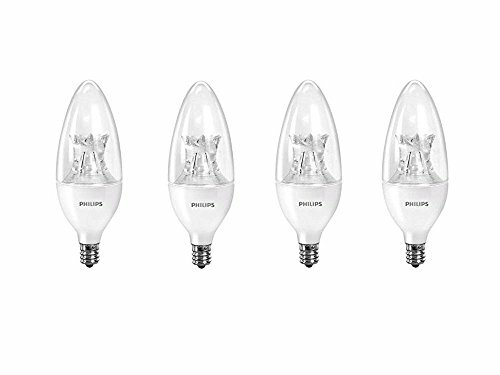 Philips B12 Blunt-Tip 7W Decorative Candle LED light bulbs offer classic, made to be seen shape and provide 500 Lumen's of soft white dimmable light, equivalent to 60-watt incandescents with 80% less energy use. These bulbs fit small candelabra (E12) fixtures. Warm Glow dimming offers flicker-free, silent dimming that works with more dimmer switches than any other LED on the market. The more you dim, the warmer the light--from 2700 to 2200-Kelvin just like traditional incandescent light bulbs. Best-in-class Philips LEDs turn on instantly with energy-efficient flicker-free, natural light at 1/4 of the energy of incandescents, 1/2 the energy of halogens and with 10X and 4X the lifespan respectively. Philips LEDs are mercury-free so they don't contribute to harmful hazardous waste. B12 soft white light bulbs are ideal use in candelabras and other decorative fixtures. Philips LED bulbs last 10x longer than incandescents and 4X longer than halogens making them a great choice for multi-socket candelabra lighting fixtures. Not for use with Philips Hue products. This pack of 4, B12 Philips LEDs comes with a 10-year warranty. Each bulb is expected to deliver a lifetime of up to 25,000 hours (based on three hours per day, 11 cents/kWh, costs depend on rates and use), saving you the cost and hassle of frequent bulb replacement.